Every girlfriend be happy, if her boyfriend present a diamond ring when they get engaged to one another. Emotion is not good for traders. Traders must be rational in their actions. I am going to write this post to explain the way to trade bullish diamond chart pattern. As the name suggests, a bullish diamond chart pattern indicates a bullish trend upon breakout of the pattern. A diamond pattern is composed of support and resistance levels. 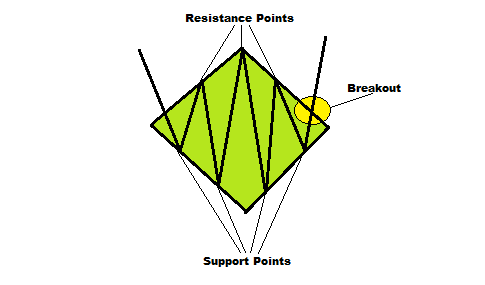 In case of breakouts of a bullish diamond chart pattern, the line through the resistance points is broken. A bullish diamond pattern can be part of a trend reversal or continuation. When a bullish diamond chart pattern appears after a bullish trend, it indicates trend continuation. On the other way, when a bullish chart pattern appears after a bearish trend, it indicates trend reversal. Bullish diamond pattern can be found on the charts of any time frames, but the bullish diamond chart pattern on the larger time frame chart is more reliable. In the above price chart, we can see a bullish diamond chart pattern is formed and broken by the price. 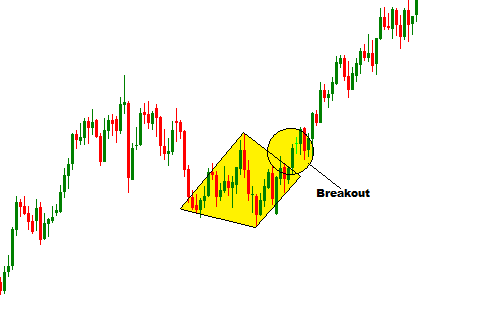 Identifying the reliable breakout of any pattern is very crucial in successful trading. We generally know two rules of a reliable breakouts. Firstly,a reliable breakout happens when a candle opens out of the area. Secondly, the volume should be increased when the breakout takes place. In addition to the above rules, I am going to introduce my own technique to identify a reliable breakout. 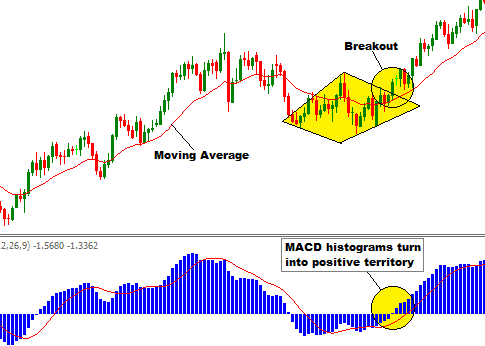 The rule is that a breakout is considered to be reliable, if the price moves above the 20 moving average (any types) and MACD histograms turn into positive territory while making the bullish diamond pattern breakout. I found this technique very effective in trading. If you have any question regarding this post, you can drop it into the comment section below. I generally response to your comments within 24 hours.